Ion Science has launched the FalcoTAC fixed photoionisation detector (PID) with 10.0eV lamp for fast and reliable detection of highly toxic total aromatic compounds (TACs) including benzene, in high humidity environments. Designed for plant-wide safety and the on-going protection of workers in global petrochemical and oil & gas applications, the new FalcoTAC instrument also boasts the company’s innovative typhoon technology for unrivalled accuracy in condensing atmospheres and extreme weather conditions. Aromatic chemical compounds produced by oil refineries and petrochemical plants form the building blocks for numerous important materials including dyes, detergents, solvents, adhesives, plastics, synthetic rubbers and pharmaceuticals. However the TACs produced in these environments such as benzene, toluene and xylene isomers, are also highly toxic. Simple to install and operate, the FalcoTAC features an external sensor for quick and easy servicing without the need for a hot work permit, and can be serviced and calibrated in a hazardous environment without having to remove the power. Ion Science’s typhoon technology prevents condensation forming on the sensor which helps to stop the FalcoTAC short circuiting and make it ideal for harsh conditions and wet outdoor environments, without the need for weather enclosures. 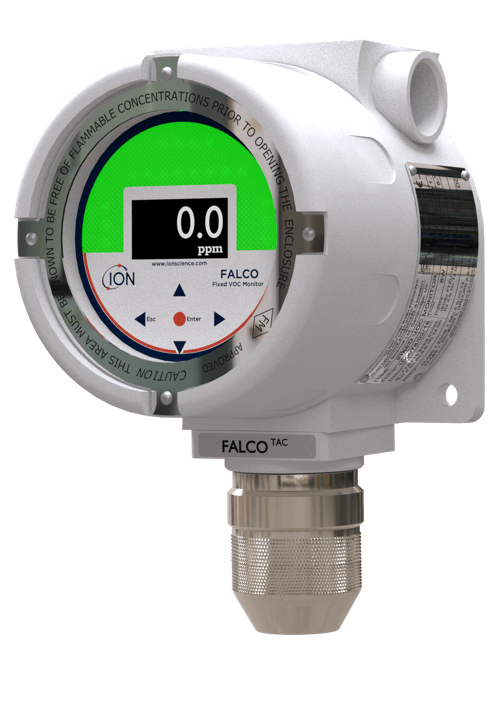 By incorporating Ion Science’s market-leading PID sensor and patented fence electrode technology, FalcoTAC does not experience quenching of response due to humidity in the ambient air. This increased resistance to humidity and contamination considerably reduced drift issues and extended run time. FalcoTAC is operated via an intuitive user interface with OLED display and five magnetically activated switches – up, down, left, right and enter – which are back lit to help confirm the correct button is being pressed. For added convenience, safety and ease of use, brightly coloured red, amber and pulsing (optional) green status indicators are clearly visible in sunlight allowing checks to be conducted from a distance. The FalcoTAC utilises a diffusive sample technique which ensures less contamination issues than pumped systems and reduced lamp cleaning and servicing requirements. Pumped models are available for applications where a sample needs to be drawn to the unit.